After poor Mark's (Wood) mother dies he gets dumped on his uncle and has to share a room with his psychotic cousin, Henry (Culkin). It starts out rosy but Henry gradually drags him into a violent spree and makes it perfectly clear that he is a seriously murderous and psychotic twelve year-old. 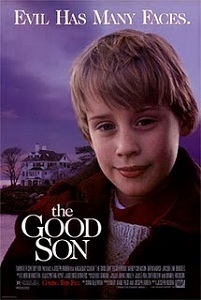 It's nice to see Culkin as a psycho child and Wood plays the other side of the coin well. It's a bit messy, probably because the project was kicked around Hollywood for a few years before it was made and Culkin's father insisted on his son getting the part (after the mega success of Home Alone 2) along with his little sister (she plays his little sister in the film). It's still a pretty enjoyable psychological thriller, worth watching if it pops up on TV but don't go out of your way to see it.